I think this is a bit of a pyrrich victory, but at least it’s a stop gap measure. UCLA has managed a compromise in its legal fight to sell the Hannah Carter Japanese Garden. Those of you who read about the initial uproar about UCLA’s proposal to sell the house and garden to developers (Ofgardens February 16, 2012) may remember that the historically important garden was given to UCLA with the stipulation that the house and garden never be sold. Nevertheless, in November 2011 the University went to court to break the bequest. The compromise reached recently is that the garden can be sold, but the new owner will preserve and maintain the garden for at least 30 years. I question the strength of the legal binding of this agreement. Afterall, it was only 50 years ago that UCLA was given the house and garden with instructions to maintain and preserve it forever. La plus la change…. The University of California, Los Angeles (UCLA) has reached an agreement with the heirs of Edward and Hannah Carter, according to the Los Angeles Times, settling a legal dispute over the immediate fate of the historic Hannah Carter Japanese Garden in Bel-Air. Under the terms of the new agreement, the university is permitted to sell the garden only on condition that the new owner agree to preserve and maintain it for at least 30 years. Created by Nagao Sakurai and faithfully reconstructed by Koichi Kawana, the garden is among the most significant examples of post-War Japanese gardens in the United States. It was entrusted to UCLA in 1964 by Edward W. Carter (and subsequently renamed to honor his wife Hannah) and the university pledged to maintain it in perpetuity. But in 2010, following Mrs. Carter’s death (Mr. Carter predeceased her), UCLA persuaded a judge to overturn the terms of the bequest and subsequently put the garden up for sale. 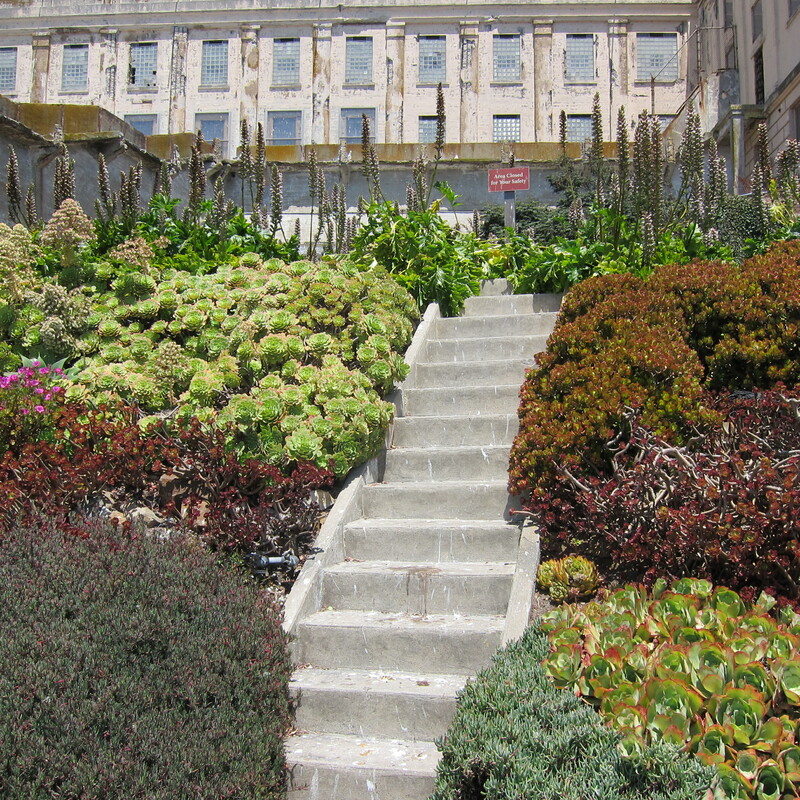 TCLF listed the garden in its Landslide program as an “at-risk” landscape in January 2012 and joined a coalition that included the Los Angeles Conservancy and others to halt its sale and ensure its long-term maintenance. Then, on July 27, 2012, a Los Angeles County Superior Court judge issued a temporary injunction delaying UCLA’s sale of the garden and upholding its legal obligation to maintain it. The garden has been closed to visitors for some time, and this most recent agreement contains no stipulation regarding public access. But it is the hope of the members of the Coalition to Save the Hannah Carter Japanese Garden that any new owner would seek a conservation easement and allow for periods of public visitation. I’ve been away for many weeks, traveling on 3 continents. I am looking forward to sharing with you all the wonderful gardens I have seen. I was rendered speechless, stunned that the gardens I had seen were being called “back yards”. I had indeed been out of the country for a long time. How could I give an answer to this question and educate this person who thought of gardens as “back yards” on the achievements of Italian Gardens from the Renaissance up to the 21st Century in the nano second I had to answer before the line behind me erupted? My mind swirled, but my subconscious came up with an answer, “By historical significance”, I replied. Now it was his turn to be shocked and speechless. We looked at each other as if we were both from other planets, not the same city, and parted each other’s company without another word, but with a certain amount of disbelief and suspicion on each other’s part. Sometimes reentry can be challenging. 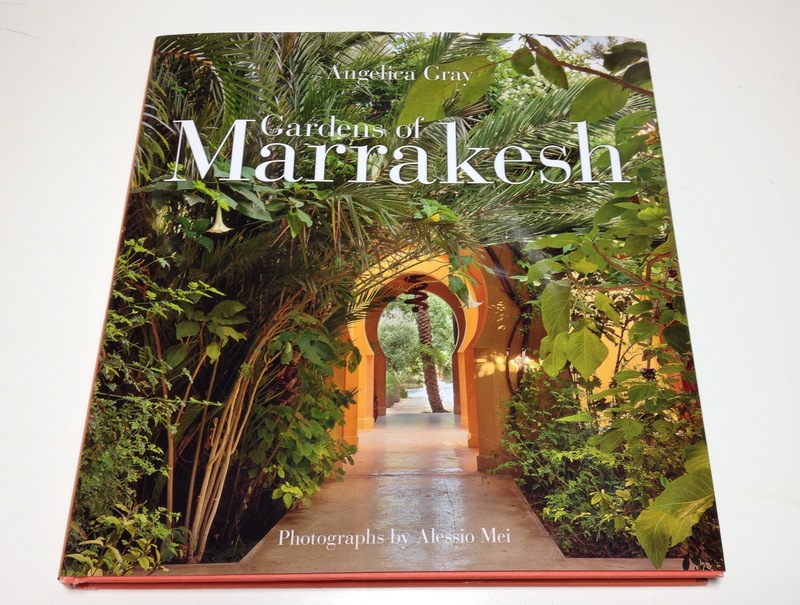 In preparation for my upcoming trip to Marrakesh, I have just read Gardens of Marrakesh by Angelica Gray. I’m glad I did. Until reading Gardens of Marrakesh, I thought the only garden worth visiting in Marrakesh was Le Jardin Marjorelle. It turns out that there are, according to Gray, at least 20 gardens of note to visit. I know I will visit Le Jardin Marjorelle, after all it has been on my gardens to visit wish list for many years. But now, thanks to Angelica, I know to visit 19 other gardens. I don’t think I will get to them all, but I will certainly try. If you’re planning a visit to Marrakesh and are interested in Moroccan gardens, do read Gardens of Marrakesh. The photos by Alessio Mei are transportive. As author, Gray does a decent job of organizing the gardens one by one and describing their strengths and weaknesses. She clearly loves Marrakesh and her enthusiasm is evident in her garden descriptions. Most importantly, she has gathered gardens worth visiting in one volume, which makes it very useful to the traveling garden visitor. Has any one been to Marrakesh and visited gardens? Has anyone read Gray’s book? How do your experiences measure up to the written description of Marrakeshi gardens? I’d like to know. 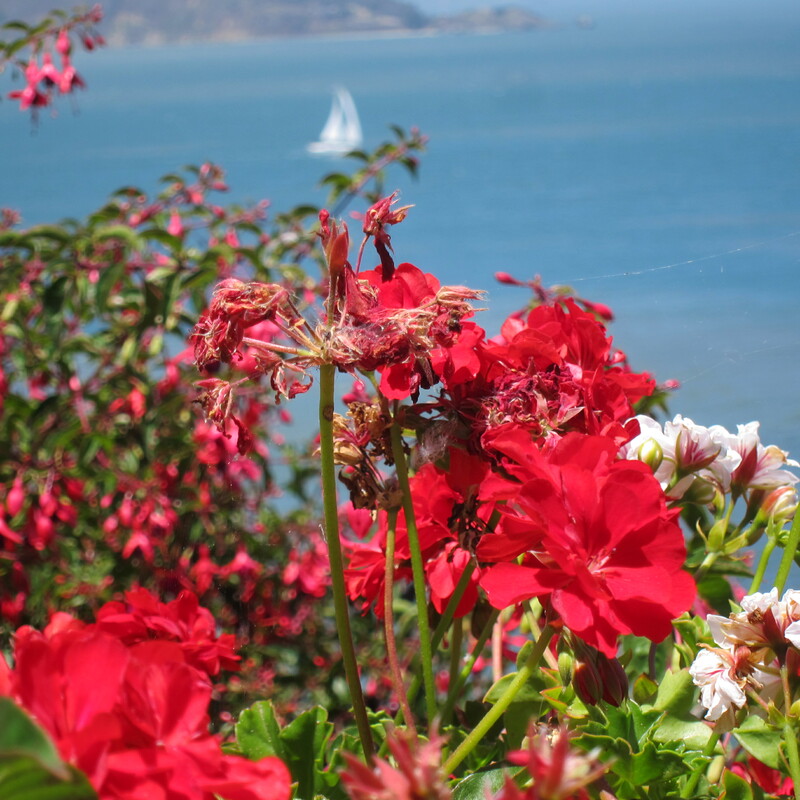 Alcatraz Island sits out in San Francisco Bay beckoning. And although I have been to San Francisco many times, for a myriad of reasons I had never been to Alcatraz, until last week. The reasons why it was last week among all the others that was the day I went to Alcatraz is as varied as the reasons why I had never been. 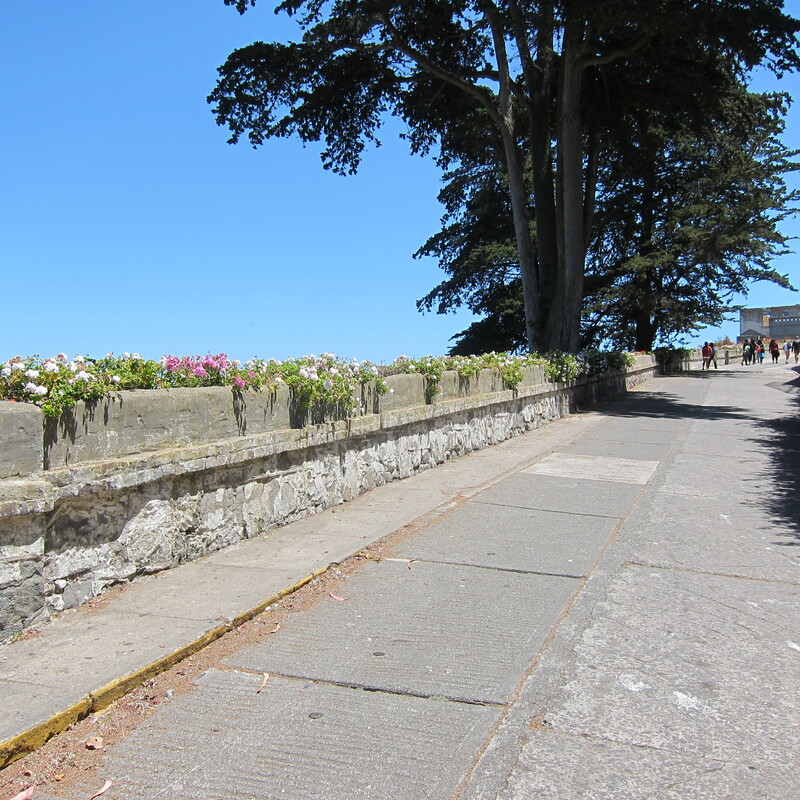 But I do know why I was very motivated to go this time – the gardens of Alcatraz. 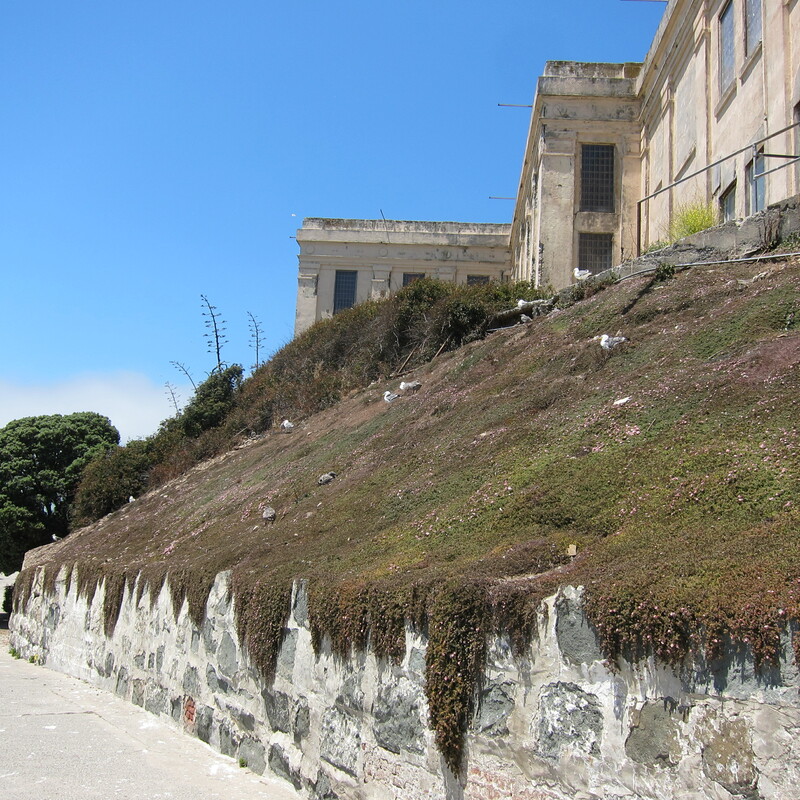 Alcatraz Island has a long history, starting in the 1840s as the location of the first lighthouse on the West Coast, then a US military base and ending its tenure as a maximum-security prison. 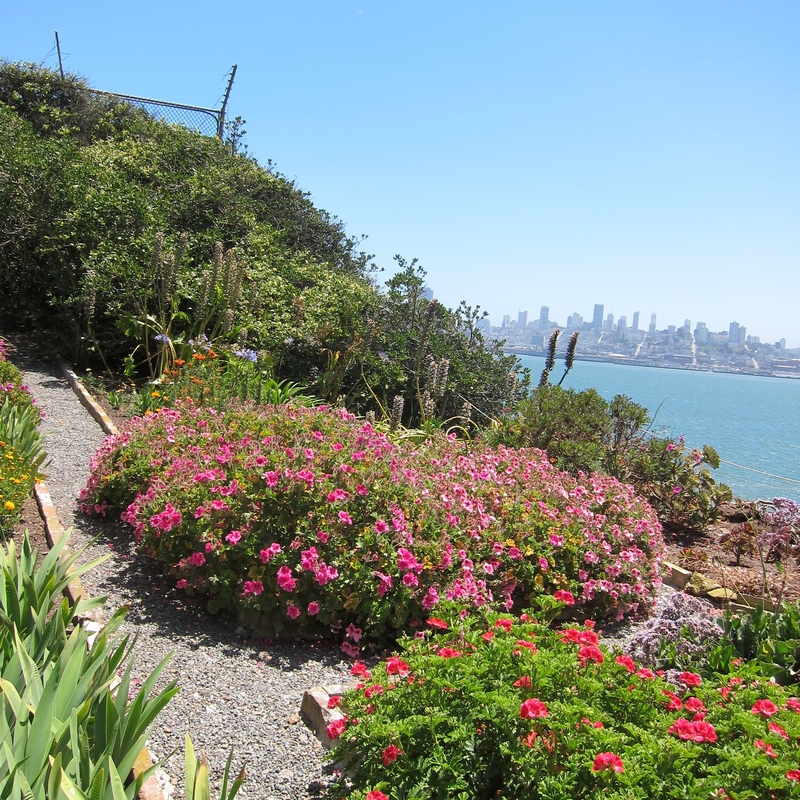 It is famous partly for housing Al Capone, partly for being ‘inescapable’ and partly because it is in San Francisco Bay. 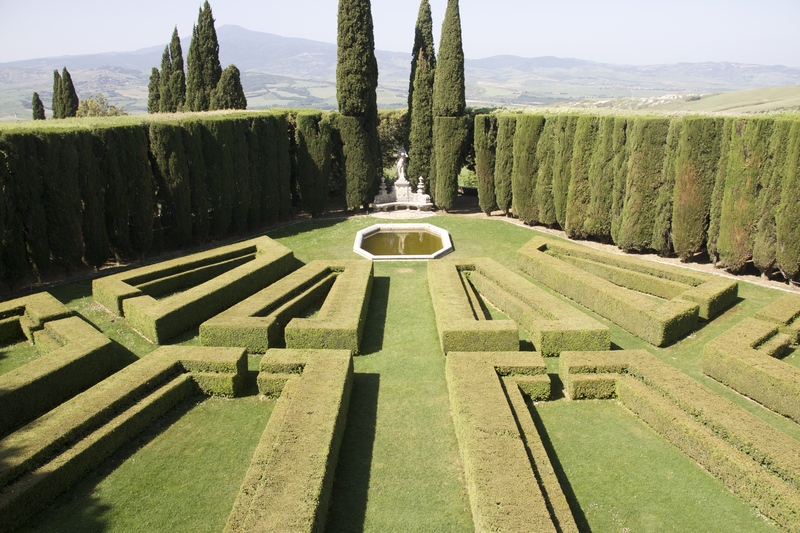 Throughout its history there have always been gardens, and although they have never been as famous as their location the recent restoration project is bringing them their due attention. 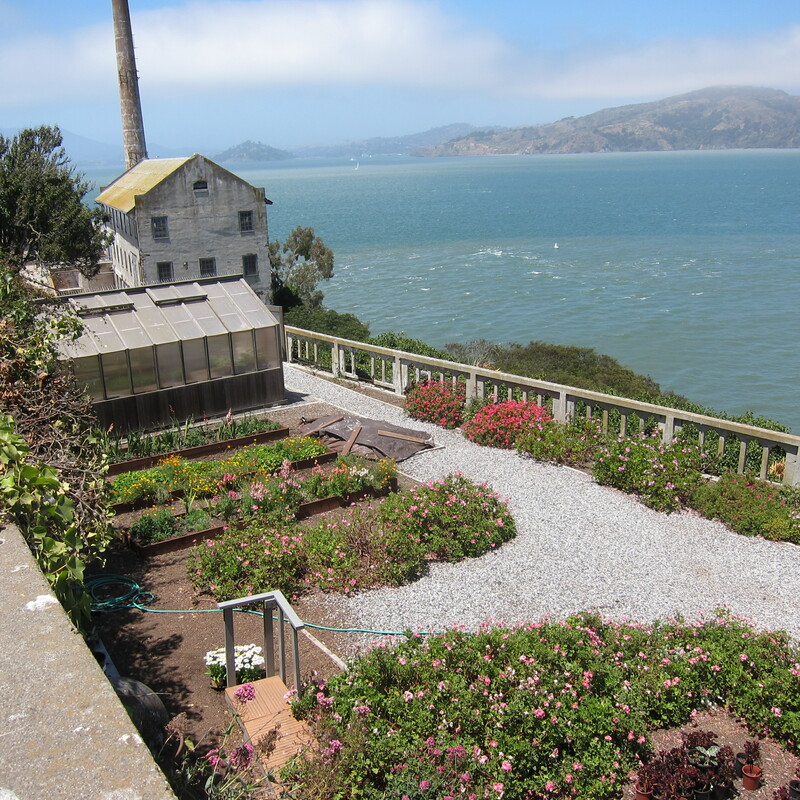 When Alcatraz was a maximum-security prison from 1934 – 1963 as many as 70 families of guards and staff lived on the island to service the prison. Under the unusual conditions of living on a desolate island along side a maximum-security prison, these families lived normal lives, including gardens. 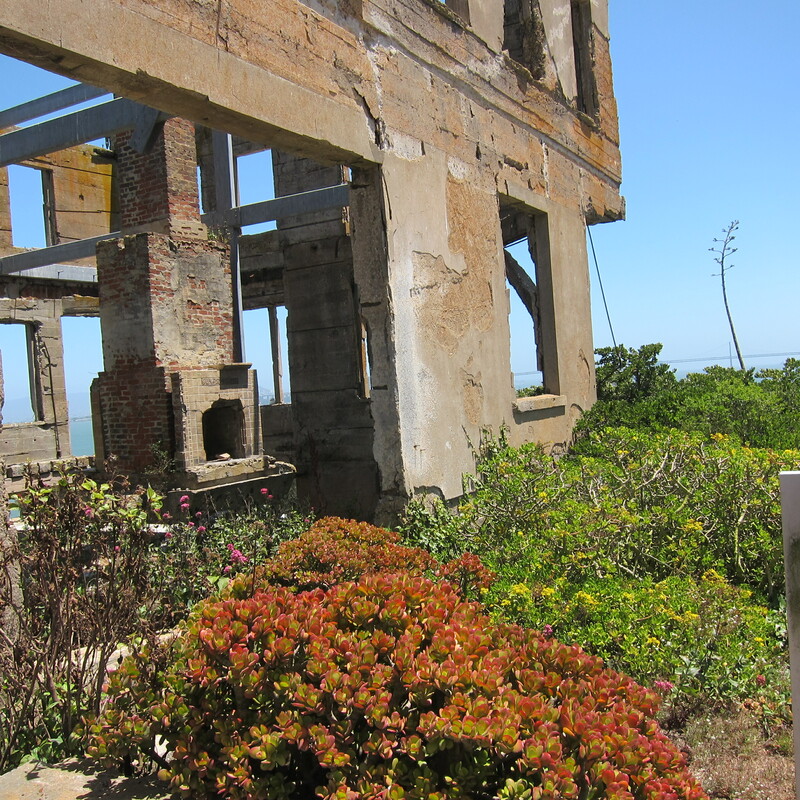 It is the gardens of this period of the island’s history, mainly the 1940s and 1950s, that are being restored. 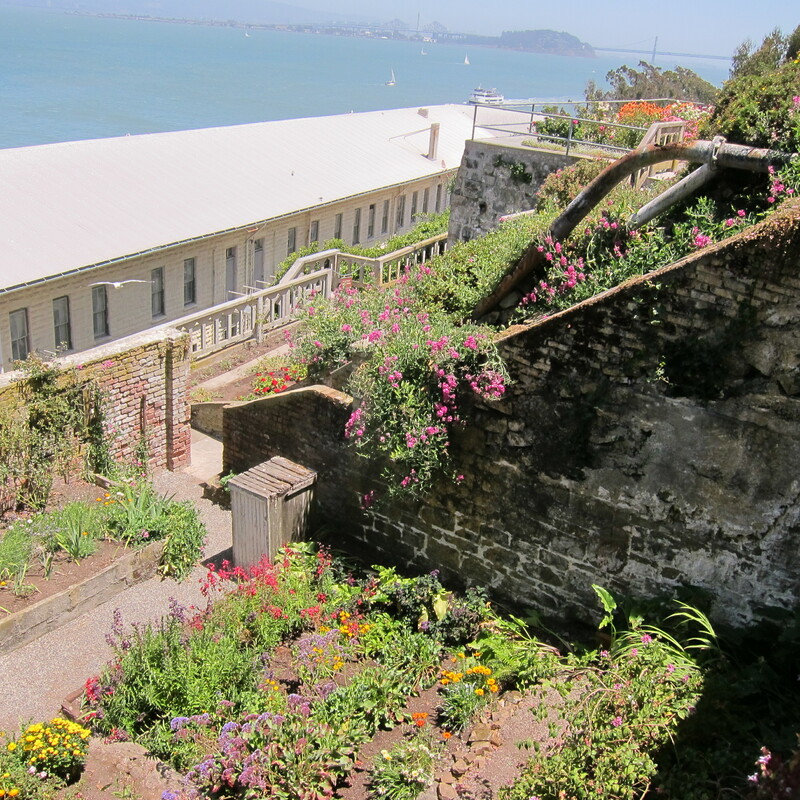 One warden had a garden and a greenhouse built for his wife, the officer’s had gardens along Officer’s Row, there was a Rose Terrace, the West lawn and Terraces and the Cellhouse Slope which faced San Francisco. 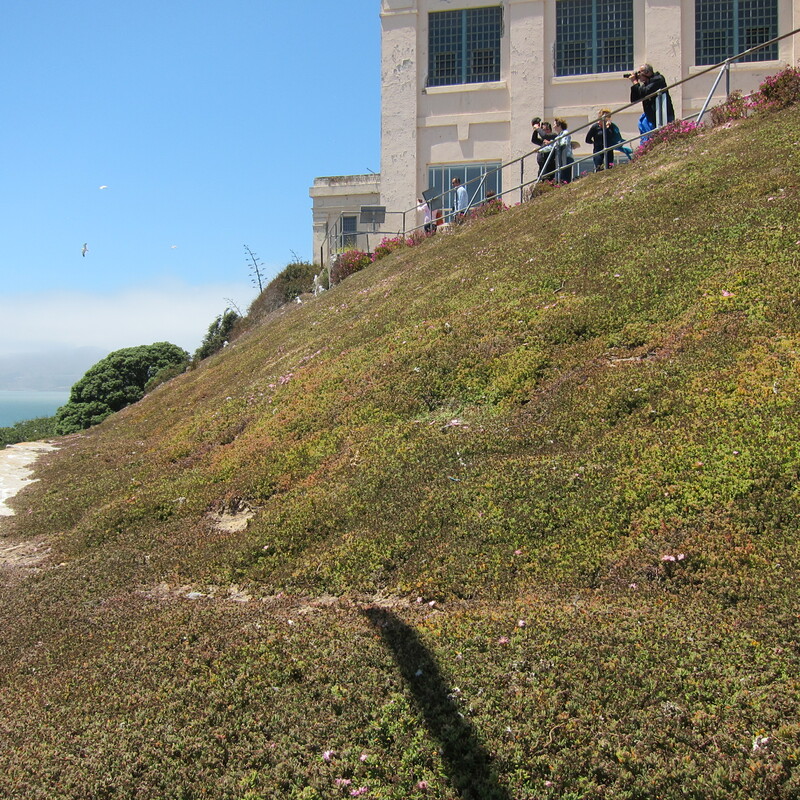 This slope was covered in iceplant, called “Persian carpet” by the inmates. The plantings served two purposes. 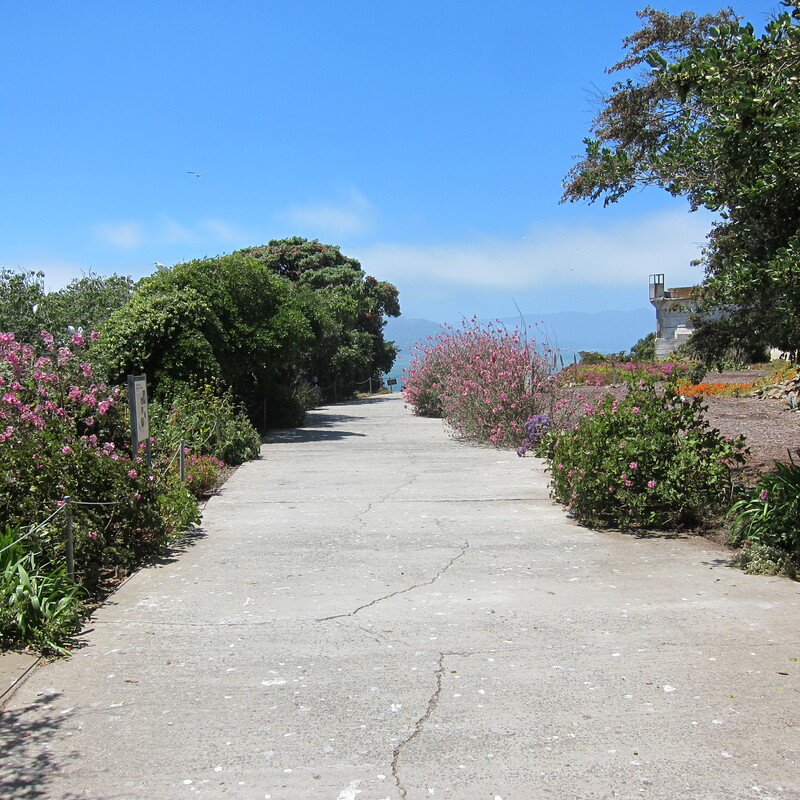 One was erosion prevention and one was to soften the look of the island from the residents across the bay in San Francisco. In addition to working on the gardens of the warden and officers, the prisoners had their own garden at the end of the West Road. 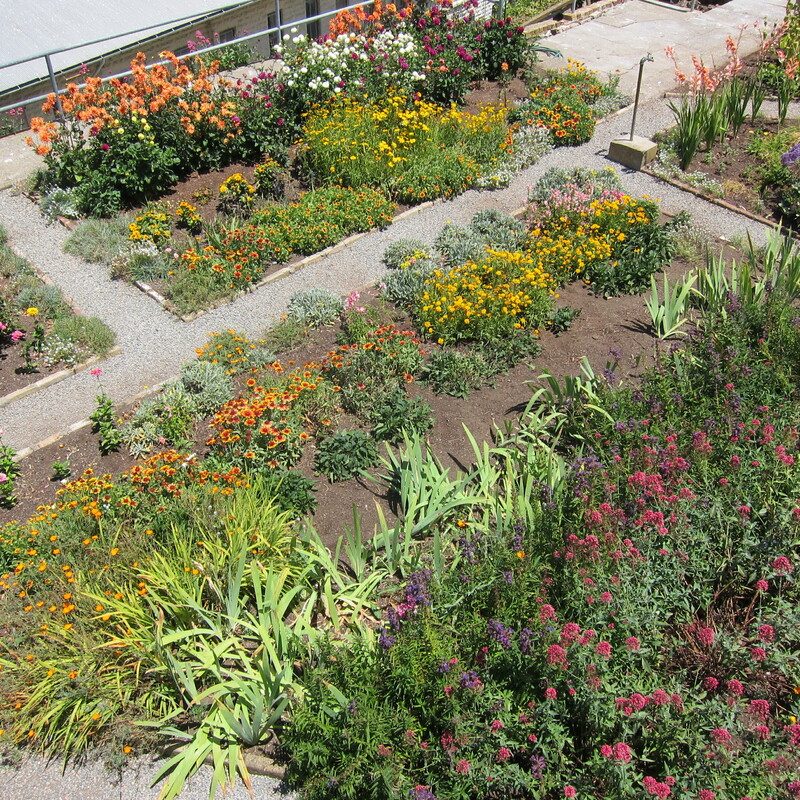 This garden was along the route that the prisoners took daily on their way to work in the prison industries. The soil was amended with garbage, a birdbath appeared, staff provided seeds and the prisoners gardened. 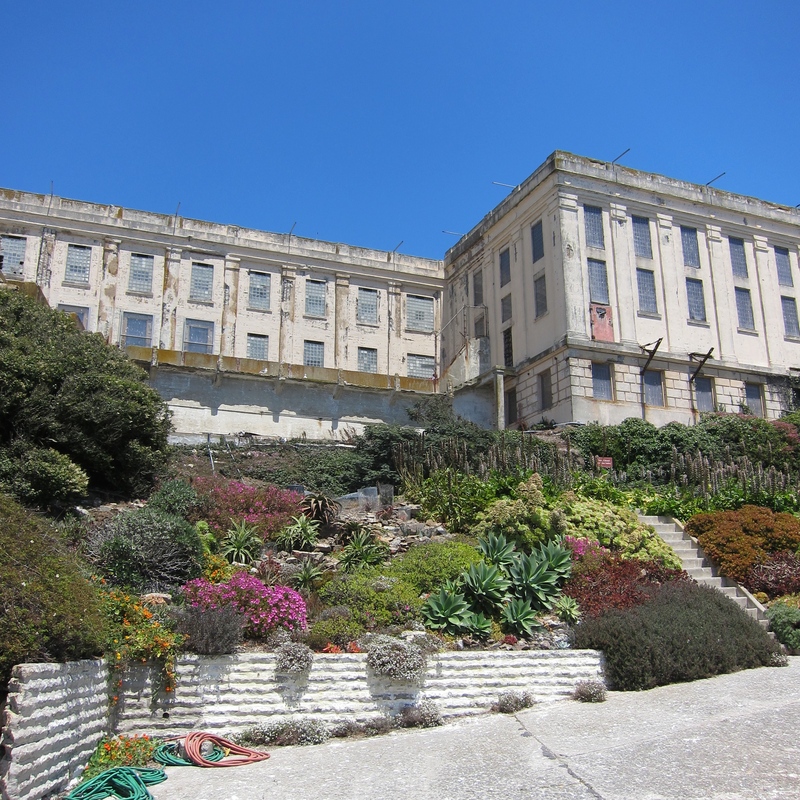 Alcatraz is an inhospitable place, known as “The Rock”. 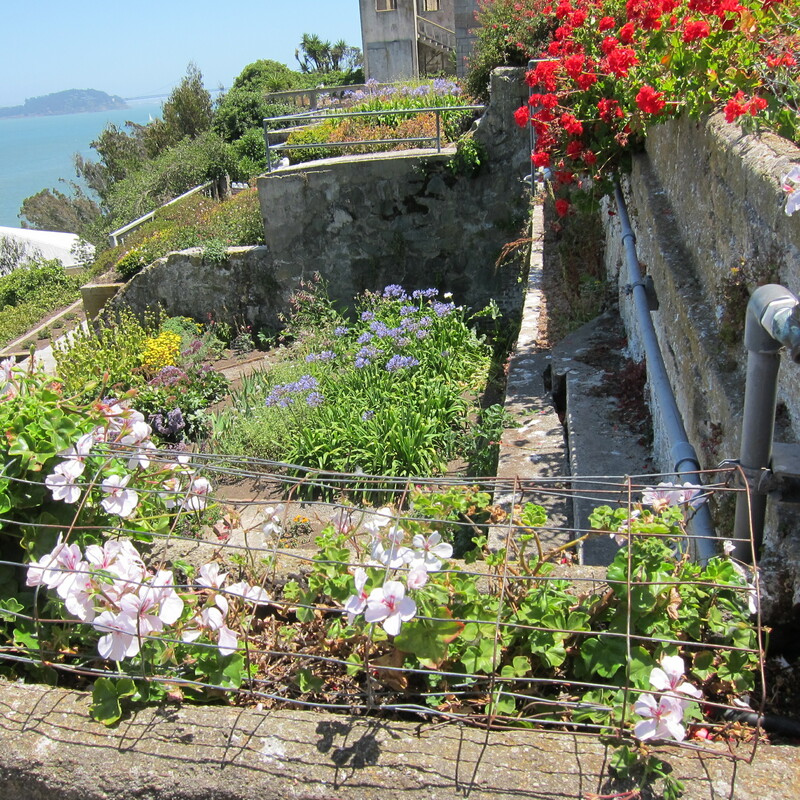 It is barren, windswept and sea splashed, not ideal garden conditions, but the residents – the voluntary and involuntary – created gardens for over a century. 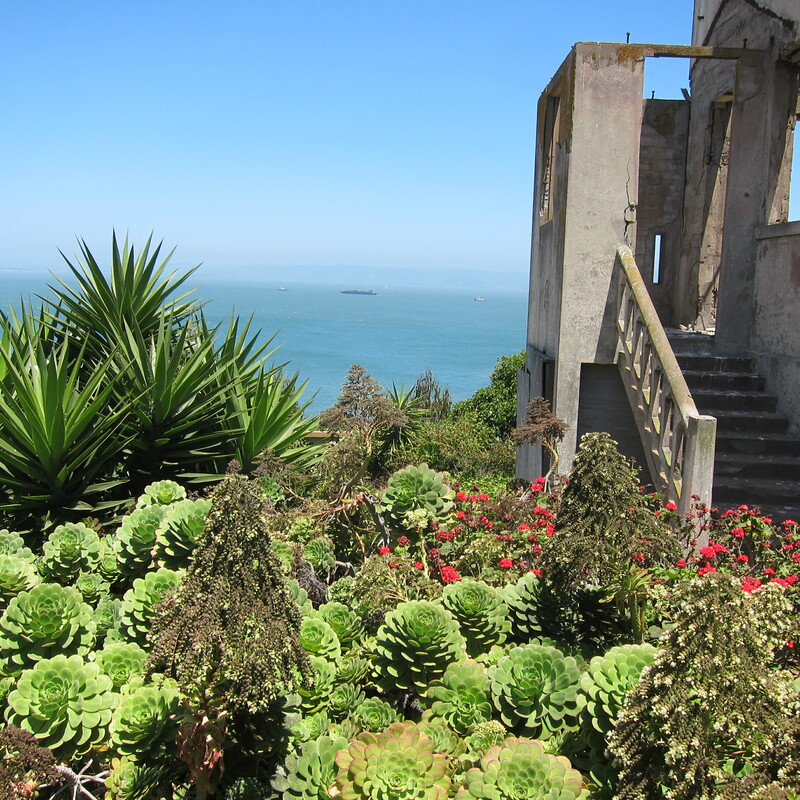 In the 1930s the warden’s secretary, Fred Reichel, contacted the California Horticultural Society and other western plant breeders to find out what types of plants would do well on the island’s harsh conditions and planted them. The prison closed in 1963 and the island was abandoned. For 40 years the abandoned gardens were untouched. 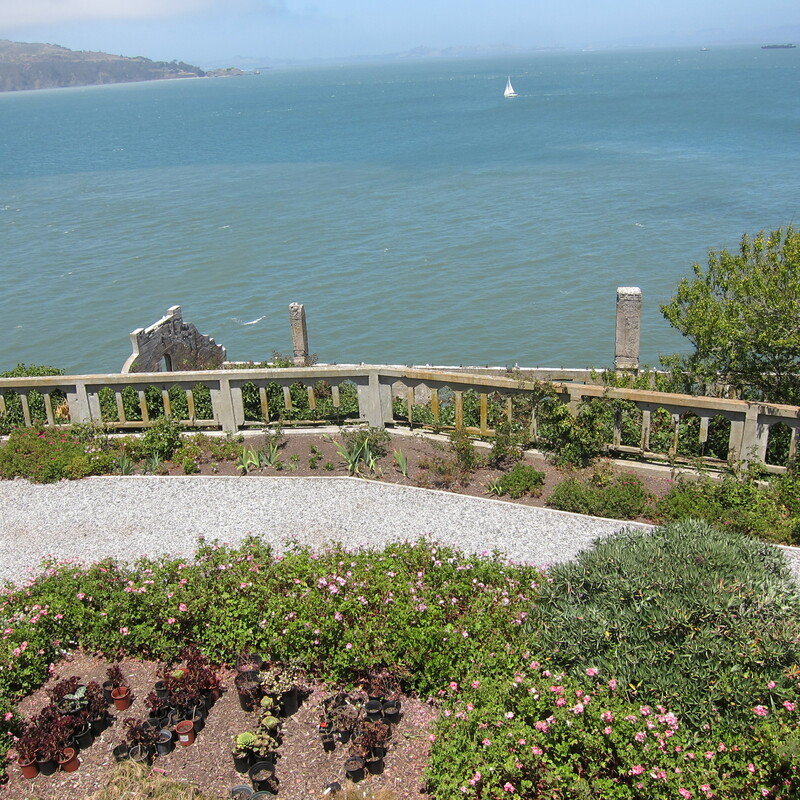 Beginning in 2003 the Garden Conservancy, the Golden Gate National Parks Conservancy and the National Park Service began a joint effort to preserve and restore the gardens. Remarkably, under the random growth of 40 years of neglect, the original gardens and hundreds of the original plantings, including those researched and used by Fred Reichel, were found to alive. Today, 11 years after restoration began, but decades after planting, the gardens are there to be seen. They are still works of restoration, but easily distinguished as gardens, and remain, as all gardens, marvels of determination and survival.